Winemaker’s Notes: Our Lodi Zinfandel is a challenging and rewarding wine to make. Amazing old vine fruit, detailed selection criteria and master blending show in the final wine. A wide array of jammy strawberry and plum aromas followed by black cherry, strawberry, and vanilla flavors lead to a smooth and lengthy finish. My Notes: I’ve been sipping on a bit of Zinfandel lately. It wasn’t something I drank much of for a while, mostly because it felt like every bottle was a challenge to see how high they could crank up the alcohol content. Of late, however, the ones I’ve sipped have been more balanced, while still on the higher end of the alcohol content. 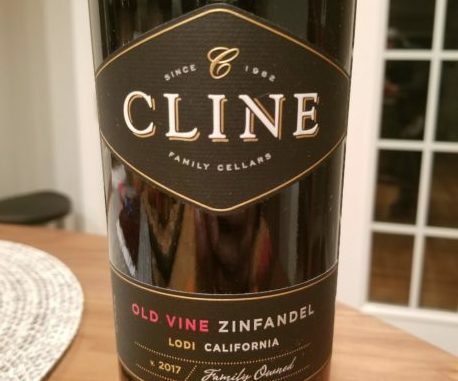 Which, of course, made me interested to try the 2017 Cline Old Vine Zinfandel to see how it stacked up. In the glass the wine was a medium ruby color, and on the nose I picked up a lot of strawberry, which carried through to the palate. The finish was clean, and overall the wine was bright and balanced, not showing too much of any one flavor or note. My wife and I paired the wine with beef stew we’d cooked all day in the slow cooker, and the bright strawberry notes were a nice counter to the heartiness of the food. For $12 I really liked this wine. It didn’t necessarily blow me away, but at that price point I was expecting a one-note fruit bomb, and this wasn’t that. True, fresh strawberry was the main flavor that I picked up, but it was balanced enough and not too in your face so as to be overwhelming or to make the wine unpalatable. A great value pick-up for that Tuesday night at home.